There is a swimming pool whose bottom and walls are covered with colored tiles. Can I describe it as a "colorfully tiled swimming pool"? I think you can. Although I wouldn't spell it that way, being British! I would hyphenate that to "*colo(u)rfully-tiled". *And I would be wrong about that. Thank you Parla. Only if the colors of the tiles are different from each other. If they are all the same color you can't. If multiple colors are used, yes. And in AE, "colorfully tiled" is correct (no hyphen between the words); we don't use a hyphen after an adverb that ends in "-ly" preceding an adjective. You wouldn't be wrong in BrE, Veli. When an adverb+adjective makes a compound adjective, the use of a hyphen is generally accepted (though not obligatory) if the adjective is attributive, but not if it's predicative. See this BBC article. The tendency these days is not to use the hyphen, because it's usually unnecessary, but I've never seen a BrE source that says it's actually wrong. Why? If the tiles are colourful (= full of colour = brightly coloured) I see no reason not to say that it's a "colo(u)rfully-tiled swimming pool". I Googled "colorfully tiled swimming pools" [images] and the most wildly colorful one was just variations on blue. I don't think I would call variations on one color "colorfully tiled". It could be an oddity but I did not find any of these oddities when I looked. The swimming pool I have in mind is actually black and white for the time being... It's a task for kids where they get black and white pictures to color according to some vague instructions, e.g. find a coin on the bottom of this colorfully tiled swimming pool. So it's an imaginary pool. If it's black and white it's not colourful. It will be once the child colors it according to the instructions . 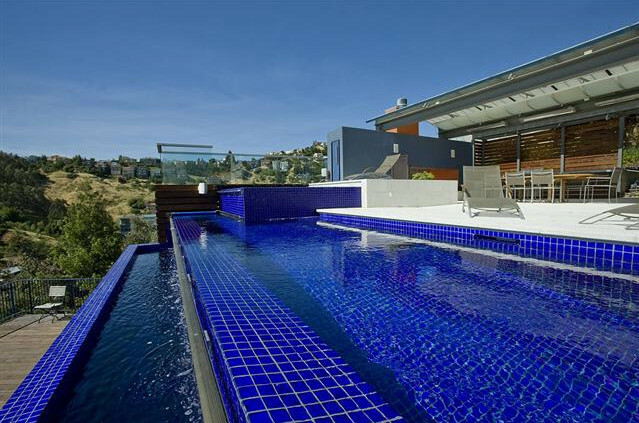 Below is a pool with vividly blue tiles. Despite that, in my opinion I wouldn't call it "colorful" because it's essentially all one color. To me, "colorful" implies many different colors. That pool certainly has an intense colour. That looks pretty colourful to me. As it does to me, too. I'd say there's quite a difference between "colourful" and "multicoloured".